Palm trees, warm sands, ocean breeze. A tropical destination is calling your name. It’s about time to pack your carry on because with direct flights to Nassau only 3 hours long, why not swap a long weekend up north at the cottage for an exotic escape to The Bahamas? With so much to see and do in the Caribbean locale, we’ve narrowed it down to the top spots you must experience on your visit! Government House, located in Nassau on Duke St., is the official residence of the Governor General of The Bahamas and dates back to 1801. For history buffs, it is fascinating to see a true remnant of Bahamian-British colonial architecture. For everyone else, the stately pastel pink and white home makes for quite the pretty picture. With an elegant dress code in effect and a must-see wine cellar, a dinner at Graycliff makes for a lovely evening out. If you’re looking for the ultimate in romance, the restaurant offers private dining experiences right in the wine cellar. For those looking for some lunch, Graycliff offers Wine Luncheon’s which are hosted by a certified Sommelier and include a five-course, gourmet meal. A delightful Afternoon Tea is also available by reservation on Monday’s through Fridays from 1:30 PM – 4:00 PM. There are plenty of tour operators in Nassau offering private sunset cruises. This is the perfect way to wind down and enjoy a romantic evening onboard a luxurious charter. Pop a bottle of champagne and toast to your spontaneous but amazing decision to visit The Bahamas. 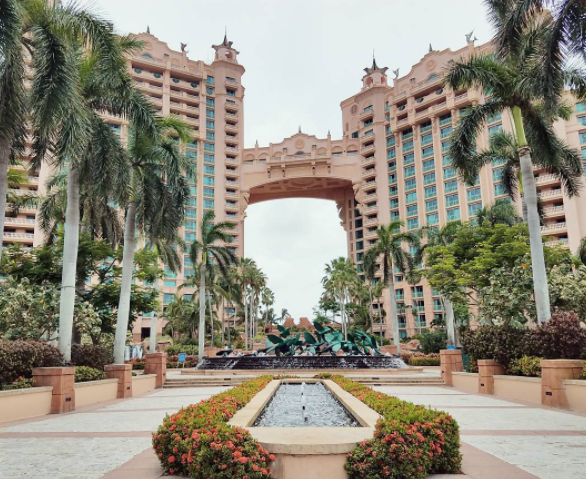 After an exciting night at Aura, head on up to your comfortable suite in the stunning Atlantis Paradise Island. Wake up in the morning feeling refreshed and ready to take on a day chalk full of fun activities. Race down the Leap of Faith waterslide into the acrylic tunnel submerged in the shark-filled lagoon. Once you’re ready to wind down, lay by the pool or grab a bite at one of 21 restaurants on-site.